In the capital city of B.C, our Gorillas will come to the rescue, removing uninvited street art. Following its history and origins with the Hudson’s Bay Company, there are hundreds of properties with historic status. Victoria Graffiti removal will take proper care to maintain and respect these properties. The ease of use, portability, and accessibility of aerosol sprays have led to increased usage for the purpose of vandalism. These tools of the trade are difficult to remove from porous surfaces like concrete, mortar and brick. Victoria Graffiti Removal uses specialized tools in order to remove the paint and overspray without any damage to the property or spreading of the stain. One of the most important aspects of Victoria Graffiti Removal is consistency. Removal is available on a weekly or even daily basis. When it comes to Victoria graffiti removal, time is of the essence! If tags are left up for several days, it is an invitation for other street artists to leave their marks. Along with stopping the encouragement of other vandals, the speed of our Gorillas makes it easier to remove paint when it is fresh. If left over long periods of time, aerosol paints can bake into the surface layers and become difficult to remove. 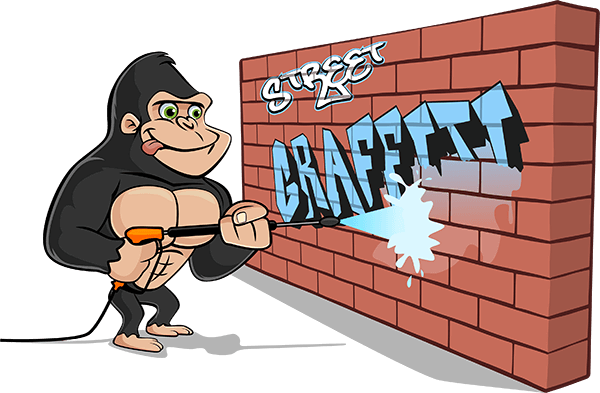 Our Gorillas will arrive quickly to remove any unwanted graffiti, using Canadian made, eco-friendly chemicals. The city of Victoria is taking initiative against street art and taking steps to stop the spread of graffiti. Walls around the core of the city, as well as certain venues around frequently-visited attractions are being outfitted with murals to promote community pride and discourage defacement from the public. Not all home and business owners will be outfitted with community murals but Victoria Graffiti Removal is here to help! Call or book online to have your property restored to its original, paint-free state.